Carlos Brathwaite will captain a star-studded Windies side in the Hurricane Relief T20 Challenge at Lord’s on May 31, live on Sky Sports. 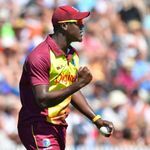 Carlos Brathwaite to captain Windies in Hurricane Relief T20 at Lord’s Windies will play an ICC Rest of the World XI on May 31, live on Sky Sports Last Updated: 17/04/18 1:08pm Carlos Brathwaite will captain Windies in the charity T20 match at Lord’s on May 31 Carlos Brathwaite will captain a star-studded Windies side in the Hurricane Relief T20 Challenge at Lord’s on May 31, live on Sky Sports. Brathwaite’s 13-man squad – which includes powerful openers Chris Gayle and Evin Lewis, as well as Andre Russell, who has smashed 19 sixes in his first four matches of the IPL season – will take on an ICC Rest of the World XI skippered by England’s Eoin Morgan. Watch how Kolkata’s Andre Russell thrashed 11 sixes in his side’s defeat to Chennai in the IPL.